The story of Rod Blagojevich is finally over. While it is sad and disappointing, it would be a lie to say it was not extremely predictable. Monday, the man who was once the governor of the state of Illinois was found guilty on 17 of 20 charges of corruption. Blagojevich was accused mainly of attempting to sell the seat that Barack Obama held in the United States Senate when he was elected President of the United States in November of 2008. The trial began on April 20th of this year and it took only ten days for the jury of eleven women and just one man to come to a final verdict. In the end, Blagojevich was convicted on all ten of the charges pertaining to wire fraud and seven of the ten charges having to do with bribery and extortion. Blagojevich was found not guilty on one charge of bribery. The jury could not come to terms on a verdict for two charges of attempted extortion. The majority of the charges could see Blagojevich serve a maximum of twenty years in jail. Blagojevich spoke to reporters a little more when he arrived at his home. 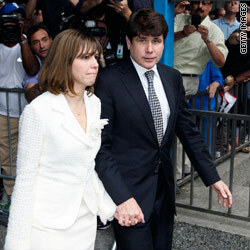 More than anything, Blagojevich expressed a great amount of guilt in letting his wife and two daughters down. He also spoke of his great appreciation of the support he is receiving from friends and followers. It is estimated that when he is sentenced, Blagojevich is going to end up getting somewhere between six and eleven years in prison. That is based on a calculation by Richard King, who is a Professor of Law at Chicago-Kent College. The story of the fall of Rod Blagojevich has come to an end. The length of his sentence is the only remaining piece to the puzzle now. If he does get as little as six years, he is going to be able to come back to his family and still be a part of his daughters’ lives and potentially try to rebuild his career. But if he gets at least eleven years, the future of Rod Blagojevich would not look good. So if they can find the Senator from Illinois Guilty, It could be Something,! and I am sure He’s got something buried !No such thing for Honest Politician !!!!!!!!!! !